Pattern and supplies to weave Potato Basket Kit. 14" oak rim, 1/4" flat reed, 1/2" flat oval spokes. Shallow, table-top. 14" diameter. Adult Advanced Level. 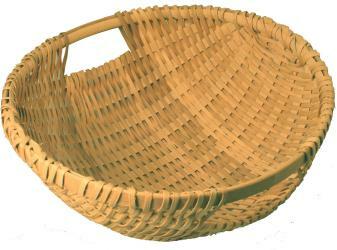 SKILLS LEARNED: Rib basket construction with one hoop rim, plain-weave with flat reed.